The City of Ridgeland announces that it is now mobile in the form of a cutting edge app. The mobile app, which is available in both the Apple iTunes store and the Google Play Android store, offers news and events plus the ability to pay utility bills and traffic fines or register for an athletic event. It opens up another form of communication with city officials. App users may post a comment, send an email, record and send a message, as well as submit a photo that will get distributed to staff that will review and respond. The app also makes it a tap away check the city’s news blog and link to the city’s various social media sites. Notifications and messages can also come to the app user from the city. “The City of Ridgeland believes in using the latest technology to stay connected with citizens. This mobile app will make it easier for citizens to communicate with us and to keep up with what’s going on in Ridgeland,” said Mayor Gene McGee. City officials say that providing better service is what the new Ridgeland app is all about. If an app user knows that they want to participate in the Natchez Trace Century Ride, for example, they can find the event on the calendar, tap on it and the link to register is right there. To pay a utility bill or to use the city’s Online Action Center, a user will tap on Services and both options are right there on the screen, along with additional online services offered by the city. As most smart phone users know, it is certainly convenient to be able to manage life’s activities from a mobile phone. Providing this service for its citizens as well as visitors is something that the City of Ridgeland is pleased to offer. 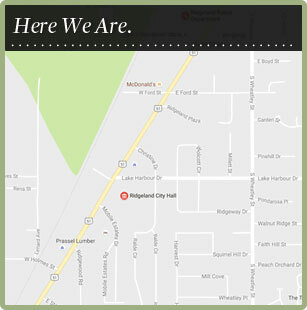 To download the City of Ridgeland app, visit the App Store or Google play.